This week Cara and I chose In Season as our theme. We do have a tomato plant that is producing a few tomatoes in our yard, but none of our tomatoes looks as good and juicy as Cara's. I decided to take a photo of a plum that I picked up at the grocery store. There was a big sign displayed that said "In Season" . I took it as a sign. Join in on the fun over at Mental Inventory. Oh wow, both shots. 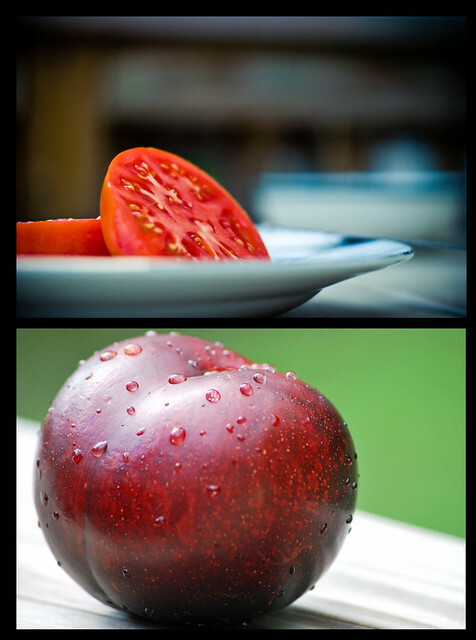 Love the drops of water on your plum and how you can see the speckled color on the skin. Love plums. Great dip, team. LOL - I also said "YUM" before I saw what the other comments were :) Beautiful shots and they are so awesome together! Oh both fruits look SO good! Awesome photography! They compliment each other well. YUM! Plums and tomatoes are totally in season. Nice tomato Cara, makes me crave blt sandwiches. ;) And that is a scrumptious plum. Nice combo this week! ooooo love the water on the plums. great job! :) so fresh! love the theme. You two match perfectly this week -- and are both making me hungry!